Nothing brings together the community better than a good old game of street hockey, especially when it’s for a great cause! HootSuite is pumped to participate in this year’s upcoming #HootHockey event, a grassroots movement led by a group of companies, nonprofits and the Dallas Stars of the National Hockey League to raise money for the Austin Food Bank. HootSuite has partnered with Five Hole for Food to organize the event, along with a number of other organizations like Nexalogy, metabridge and North of 41. They’ve all strapped on their “skates” and submitted teams for what promises to be an amazing day. All proceeds ($300 per team) will go towards the Austin Food Bank! 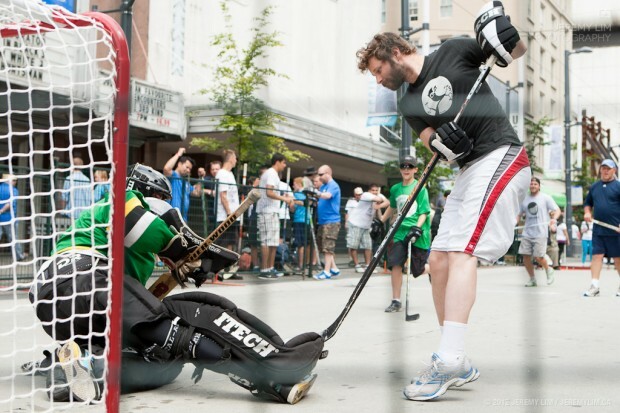 #HootHockey, #SXSW’s “coolest” game will take place on Sunday, March 10 from 1pm to 4pm CST at 9th and Trinity intersection in Austin, Texas. It’s not too late to get involved! Checkout the #HootHockey with the Dallas Stars Facebook page for more details and fill out this form to get your team into the game! Come play a little hockey, take part in the metabridge Dallas Stars Skills Competition, and cheer us on to get some swag from HootSuite and other rad companies. We look forward to seeing you there and, after all good hockey games, celebrating with a nice cold beverage! Leave a comment if you are planning on coming. We would love to meet you! And also don’t forget to checkout #SXSW 2013 ~ HootSuite brings the #HootBus, #HootUps and HiJinks to Austin for a complete list of activities to expect from HootSuite at this year’s event and follow our group of Owls heading to Austin.